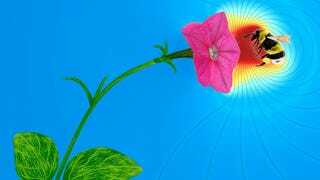 Flowers may be silent, but scientists have just discovered that electric fields allow them to communicate with bumblebees and possibly other species, including humans. It's well known that color, shape, pattern and fragrances allow flowers to connect with pollinators, but the new study, published in the journal Science, adds electricity to this already impressive lineup. "We just now have discovered that electrical potentials, an unavoidable by-product of flying in air for bumblebees and being grounded for the flower, is being exploited to benefit both parties," co-author Daniel Robert told Discovery News. It's "another example of the beauty of evolution," added Robert, a professor in the University of Bristol's School of Biological Sciences. He explained that bees have a positive electrical charge because they fly in air, which is full of all kinds of tiny particles, such as dust and charged molecules. Friction from these particles causes bees to lose electrons, leaving bumblebees positively charged. Flowers, on the other hand, "are electrically connected to ground," he said. Unlike copper wire, which transfers charges very quickly, plants conduct electricity very slowly and tend to possess a negative charge. For the study, Robert and his team placed petunia flowers in an area with free-flying foraging bees. The researchers then studied how interactions between the two changed the electric fields and the bees' behavior. They determined that when a bee lands on a flower, this generates its own electrical field, and therefore a force. It's as though a mini spark results when the two connect. Robert and his colleagues believe "that the bee can sense this electrically induced force." It appears to improve the bee's memory of flower rewards, such as pollen and nectar, affecting later foraging. The flower, in turn, is electrically changed for a short period after the interaction. "Bees have what has been observed to be flower constancy, (meaning that) once they forage, they tend to keep going to one type of flower, and they keep going until they feel that the rewards are not worth it anymore," Robert said. "We think that flowers have their say in that strategy, and inform the bees that the supply will be back soon," he added. This is "a dynamic interaction." This process of flower informing brings together all of the plant's communication tools. It appears that electricity boosts the power of the other tools, such as color. "We have demonstrated that when there is an electric field present, even a mild one, bees can learn the difference between two colors faster," Robert said. "So, like in a commercial advertisement, the main and obvious message can be supported by co-lateral cues that do not necessarily convey information about the product, but are easily associated with it." Thomas Seeley, chairman of the Cornell University Department of Neurobiology and Behavior, is intrigued by the possibility that electric fields may facilitate rapid and dynamic communication between flowers and pollinators. Seeley told DNews that the study "opens a window on a sensory system of the bees that we had no idea existed and no idea was used by bees during foraging." More research is needed on this newly discovered phenomenon, but it is even possible that electrical field changes happen when humans and other animals, such as birds, interact with flowers. As Robert said, "When you bend over to sniff a flower, it will change (the flower's electrical) potential. What the flower makes of that, I would not know… But I do hope very much that someone will take this up and look into it." Images: Julian Harris, Dominic Clarke and Daniel Robert.